This is interesting for those of us who like to study the SERPS. 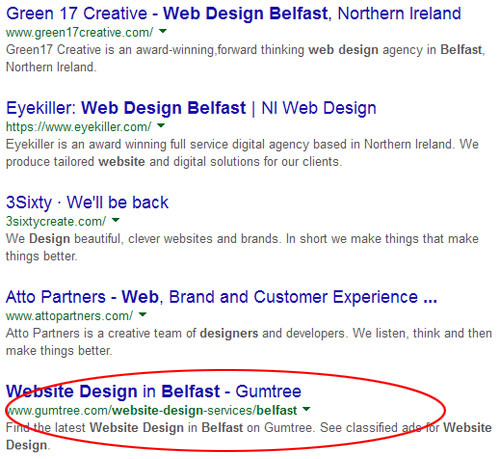 For the first time Gumtree is on the first page of Google SERPS for ‘web design Belfast’. I’ve checked this over the last couple of weeks and http://www.gumtree.com/website-design-services/belfast appears at number 6 in Google (see the screenshot below). Google stopped showing Places listings for ‘Web Design’ terms along time ago, though maybe the effect of Google Pigeon is to have boosted directories such as Gumtree in the Organic search results as well. I’ve also noticed that one of my own directories Graphic Design Belfast is no1 in Google for ‘Graphic Design Belfast’. Did Gumtree not rank on page 1 years ago for this keyterm? Maybe back in 2010? 4NI was another directory that used to dominate results for local keyterms. Barry I’d be surprised if it did, this would have been a keyword i would have watched now and again and I never remember Gumtree appearing on the 1st page. As for 4NI, this directory did/does well in local results but usually in weaker markets, were page one results haven’t been optimised.